Q. What is Poker Tracker? A. According to the Web site, "Poker Tracker is a Windows based computer program that allows you to analyze your on-line Texas Hold'Em play. Poker Tracker stores and summarizes hand history data that can be downloaded from your poker site." Poker Tracker works with both ring games and tournaments for Party Poker and its skins (Empire Poker, Intertops, etc. ), Paradise Poker, PokerStars and Ultimate Bet. Ring games only are supported for Absolute Poker, Prima Poker (The Gaming Club, 7 Sultans, etc.) Ladbrokes and Cryptologic (William Hill, Intercasino, etc.). Here's a list of poker sites if you would like to support us and our efforts. Q. What is the Poker Tracker Guide? A. The Poker Tracker Guide is an e-book written by two seasoned online players who teach you how to use the software to its full capacity. We teach you not only how to improve your own play, but also how to gain an informational advantage over your online opponents. Check out our "About" page for more information. Q. Who wrote the Poker Tracker Guide? How do they know what they're talking about? A. 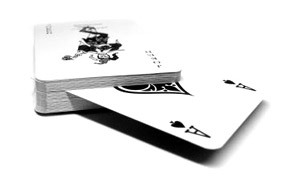 The Poker Tracker Guide was written by two seasoned and successful poker players. Both make extensive use of the Poker Tracker software while playing online. Perhaps more importantly, this book has been endorsed by the actual author of Poker Tracker. For more information about the authors, be sure to check out our Bios page. Q: Why should I shell out $20 of my hard earned money for an e-book? A. In any competitive endeavor, those with a greater amount of information than their opponents have a competitive advantage, and a higher chance of success due to this advantage. The Poker Tracker Guide gives you a huge competitive advantage over your opponents, and drastically increases your chances of success at the online poker tables. Think of it this way: if you play $.50-1 limit poker, The Poker Tracker Guide pays for itself if it helps you win only 20 big bets more than you would win without it. We strongly feel that the informational advantage offered by the guide is worth at least 20 big bets at any limit. Q: What does the Poker Tracker Guide contain? A. More than 60 pages detailing advanced uses for the Poker Tracker software. Screenshots are included to help illustrate important concepts. In addition, we've included a .txt file that includes the parameters for auto-rating your opponents (see section 2.3.1.5: Putting it all together: auto-rating the players). Q. Do I need to purchase Poker Tracker separately? How do I get it? A. Poker Tracker is available at www.pokertracker.com. You can download the software and import 1,000 hands for free. If you'd like to continue using the software after 1,000 hands, you can order a registration key for $55. Trust us; this is money well spent for any serious online player. Q. Who's the target audience? Who will benefit from it? A. The Poker Tracker Guide will appeal to both novice and more advanced users. Anyone using or thinking about using Poker Tracker will surely glean many useful tips and tricks from the text. Check out our table of contents to see all the topics covered. Q. Doesn't Poker Tracker come with its own user manual? Why do I need another one? A. Poker Tracker does come with its own user manual, which provides basic instructions for many of the software's features. However, we feel that it simply scratches the surface. We focus and expand on the most useful features of the software, such as the best ways to review your own play, auto-rating players, importing player notes and using Poker Tracker plug-ins. Focusing on these topics can mean immediate results at the tables. Q. How does the ordering process work? A. We offer two ways to pay for the guide. The first is via Neteller, an online banking site that allows you to transfer money to the authors of the book. For more information on the Neteller purchasing process, please click here. The second is via PayPal, a secure online purchasing site that allows you to pay through your existing PayPal account or via credit card. To purchase the book securely through Paypal, please see our order page. Q. Do I need special software to view the book? A. The Poker Tracker guide is available as a .pdf file, which can be viewed with Adobe Reader software. Click here to get a free version. Q. What if i lose my code? What if my hard drive crashes? What if i get a new pc? A. Email us and we'll take care of you. Q. Will I be able to print it out? A. Yes. Adobe Reader allows users to print their documents. Q. What is an access code and why do I need one? A. We've taken measures to prevent piracy and "locked" the e-book using special software. The locking software only allows access to the PDF only to those who have purchased the book. When you have completed your purchase, you'll be emailed an access code, which will allow you to "unlock" the book on one computer and one computer only. We regret the fact that we are forcing this limitation upon our users, but unfortunately, piracy is rampant on the internet and we would like to receive something for our hard work. Q. I purchased the book but haven't received my code. What's going on? A. If it's been more than a few hours and you haven't received your code, you may need to check your email settings. The anti-piracy software generates an email from the address "access@cbprotect.com" that contains the code. Some users have reported that their spam blocker has classified this email as "junk mail," so please check your junk mail folder for your access code. If you still can't find it, email support@pokertrackerguide.com.